In 2009, the Government of Gujarat, through a notification, had brought 68 villages (43 villages of Kalol and 25 from Ahmedabad and Gandhinagar talukas) with a total area of 625 sq km (62,500 hectares) into the Ahmedabad Urban Development Authority (AUDA) boundary. In the beginning the farmers were happy with this since they expected many basic amenities to be made available to them. After eight years, and the situation remaining as it was, the farmers have today realised that it is nothing but another ploy by the government to appropriate their land in the name of ‘development’. While on the one hand their situation has not changed for better, on the other, the merger into AUDA and consequent mutation of their new tenure land into old tenure has brought about a sharp appreciation in the value of their land due to increased jantri rates. The farmers with a large amount of new tenure land have thus had to endure a major financial blow. Panchayati raj institutions have been rendered redundant. Wealth tax and electricity bills have gone up. The village residential area has been limited and future expansion will be difficult. The experience of so many years has shown that the lands purchased by big industrial houses – Adanis, Arvind Mills etc. – easily gets converted into non-agricultural (NA), their plans are just as easily passed and construction also happens in no time. Those considered close to powers-that-be can get entire zones changed in their favour, while the ordinary farmer is made to run from pillar to post, seeking mere change of purpose from agriculture to NA. 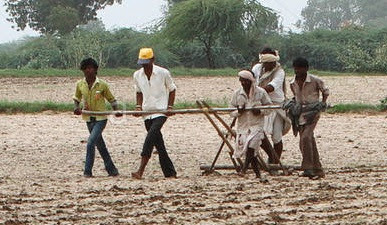 People of these villages feel that if the town planning (TP) schemes of AUDA get implemented they would lose 40% of their land, the village gauchar and wasteland will automatically, at no cost, be claimed by AUDA, and the villages will most certainly have to lose their income worth several crores of rupees from dairying. The AUDA notification therefore is not ‘development’ but ‘destruction’ for them. They fear that they would be impoverished, while their land taken away for purported ‘development’ will be handed over to big industrialists. Seeing the success of movements against the urban development authorities of Surat, Vadodara, Rajkot, Jamnagar, Gandhinagar, Junagadh, and other cities, as also the ongoing movement against the Dholera special investment region (SIR) and the scrapped SIRs of Mandal-Bhechraji, Olpad and Hazira, Ahmedabad farmers here have realised their mistake in not opposing their merger into AUDA. The farmers of the area had invited Khedut Samaj-Gujarat (KSG) to help them better understand the implications of merger into AUDA. Village meetings were held in villages Vayana and Thol, and the people present there have opposed AUDA’s plans. There will be more such village meetings in the days to come. In the meetings at Thol and Vayana villages, I made it clear that this will be a totally apolitical movement, of and for the farmers, pastoralists, and will be a democratic, peaceful and non-violent movement. All those in favour of these issues can join the movement. No banners or symbols of any political party will be allowed. Political leaders, if they so wish, may support the movement from outside. More meetings are planned in the coming days and weeks and farmers and pastoralists are invited to join in large numbers.